Experiencing the great outdoors is something that everyone should get out and do. There is nothing quite like the sobering and tranquil feeling of camping. When you are in the wild, it’s important to plan ahead and choose and appropriate shelter. Camping is like a vacation, and you’ll want to make sure that if you are spending the night, you’re doing it comfortably. Whether you are hiking, camping at a campsite, roughing it in a vehicle, or just making your own way, there is a shelter for you. We want to discuss a few of the common shelter types you can use, depending on your situation. As always, plan ahead. 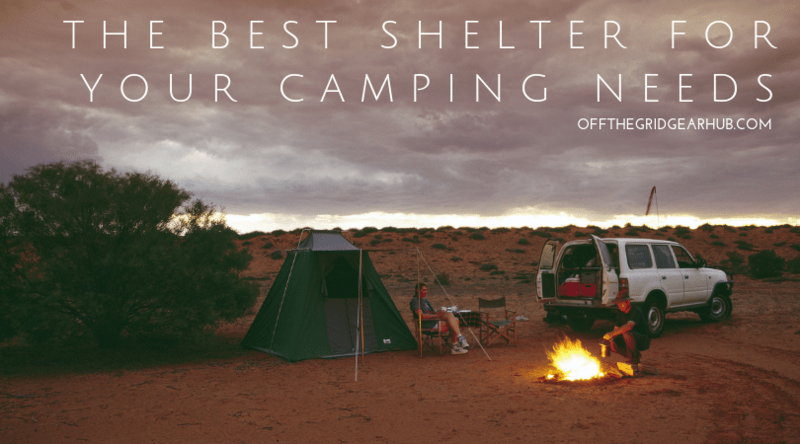 With this guide, you’ll be able to choose the best shelter for your camping needs. If you are hiking out to a remote locale, weight is a concern for your pack. Planning ahead and choosing a tent that is right is crucial for having a good experience. Choose one that is light, easy to set up, and waterproof. Make sure it’s large enough for yourself and your party. Another specification to consider is the maximum or peak height of the tent. If you are a taller person, or find crouching and bending straining, then consider a taller tent so you can comfortably stand. If you are particularly adventurous, you can opt to make your own from the environment. This is probably best for the more experienced outdoors person. If you know you are going to be staying in the area for a couple of days, it could be worth the energy and time costs to make a shelter from scratch. These may not the most comfortable shelter, but can be rewarding in its own way to create one. A basic shelter can be as simple as the modest lean-to. Simply find some larger/thicker wood for your frame. Angle them against a sturdy surface, like another tree. Lastly drape pine needle boughs across your frame. Use leaves to fill in gaps. Ideally, you’ll have a mattress or a tarp handy for the floor. If that’s not available, use more wide leafs or pine needle boughs. Another option for the woodsy camper is to camp out in a vehicle. A larger vehicle like a station wagon, SUV, van or pickup truck (with a bed roof) can be ideal. Vehicles are great to camp in, as they are sturdy and off the ground. Depending on your configuration, you could find it a bit cramp. There are some inflatable mattresses designed specifically for the rear seats of a vehicle. They inflate into your rear foot-well to make a flat surface. One thing is to consider is rain, often times raindrops will ‘ping’ off the metal roofs of vehicles, so it could be hard to sleep. No matter what vehicle you choose, make sure it’s in good working order and check the fluids before you head out. Also, be sure the spare tire is in good condition. With all things being equal, we recommend a well researched tent. Choose one that works best for you. Make sure you pack a tarp along with your tent. You can use it to create a spacer between the tent and the wet ground. Or, use it on top to keep rain out. Try out your tent at home first before you head out. You’ll get some practice setting it up and it’s a good opportunity to inspect it for rips, or missing parts. There are many tents on the market, so take some time to research them all to find one for your exact needs. Keep safe, stay warm and dry, and most important, have fun out there!